Ruling party has lost 5 out of 6 by-elections since 2011 and Prof Gilbert Bukenya says that is just the beginning. Voters in Buganda appear to have turned against the ruling NRM and embraced opposition candidates in the last couple of by-elections. Evidence of this can be found in the fact that last week’s loss in the Luweero Woman MP race made it five defeats for NRM in six by-elections in Buganda alone. Around the country, 18 by-elections have been held since the February 2011 elections, six of these in Buganda. The six are Busiro North, Entebbe municipality, Luweero (November 2011), Butambala, Bukoto South and Luweero (again). NRM lost in all the by-elections in Buganda, save for Busiro North. However, the ruling party can claim little credit for the Busiro North victory because former Vice President Prof Gilbert Bukenya essentially campaigned as an independent candidate, having discouraged NRM officials, including the chairman (Museveni) from playing a role. Some analysts have argued that this trend might continue, and these include Bukenya himself. “NRM has lost hold of Buganda because the Baganda have realised that they were getting a raw deal from the government,” said the former VP, who is still Wakiso NRM chairman, but nevertheless campaigned for the victorious DP candidate in the Luweero by-election. “There is nothing to show, apart from empty promises,” Bukenya told The Observer on Monday. Bukenya broke ranks with the ruling party after he was dropped from cabinet and charged in court for alleged corruption in 2011. Some NRM politicians in Buganda are worried that this trend might cost them, more so as President Museveni appears to be focused on forging new alliances in the north and east. “We must re-strategise, rebrand and give the party a new look and a new message, because the [former presidents] Obote-Amin stories we have been using are now stale,” said Mityana North MP, Godfrey Kiwanda Ssuubi. Campaigning for Rebecca Nalwanga in the Luweero by-election, President Museveni likened DP president Norbert Mao to former president Milton Obote, which some NRM leaders said was not in good taste, especially given that majority of the youthful voters were not born when Obote was president. Besides, an NRM MP who declined to be named added: “Mao is fluent in Luganda unlike [the minister for Political Mobilization Richard] Todwong,” who led the NRM campaign machine in Luweero. “This was self-defeating on the part of the president,” the MP said. Asked to comment on NRM’s performance, Todwong told The Observer that his party was unable to respond to the people’s many issues adequately. As in other parts of the country, electoral issues here include poverty, unemployment and poor infrastructure. Other party leaders have blamed the choice of teams leading NRM campaigns for the dismal showing in by-elections. 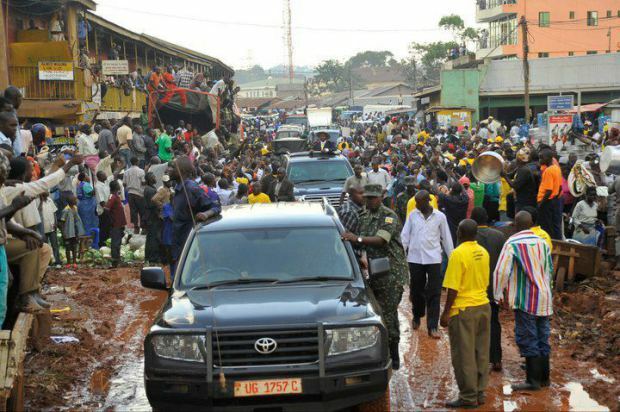 In the November 2011 Luweero by-election, NRM’s bid was led by Vice President Edward Ssekandi, while Chief Whip Justine Kasule Lumumba headed the Butambala campaigns. Both of them ended in failure. In Bukoto South, Dorothy Hyuha, the deputy secretary general, was in charge. “You can’t deploy the likes of Ssekandi, Todwong, [Sarah Kataike] Ndoboli or Hyuha and expect them to match the opposition team consisting of [Betty] Nambooze, [Mathias] Mpuuga, Muwanga Kivumbi or [Moses] Kasibante,” said one NRM MP. “Apart from Amelia Kyambadde, there is no influential Muganda in cabinet. I mean people that can move the masses like the opposition does,” the MP added. This view is partly shared by the party’s national vice chairman in charge of Buganda, Hajji Abdul Nadduli, who argues that NRM has failed to match the opposition’s new approach to politics. Nevertheless, NRM has learnt its lessons from the losses, says Nadduli, who also laments the exodus of historicals. What is required of the party leadership now is to look into the factors that are pushing out historical members, he says, citing the likes of Col Kizza Besigye, Col Amanya Mushega, Gen Mugisha Muntu, Gen David Sejusa and the expected departure of Prof Bukenya. “You’ll be creating more problems if you move to punish such elements,” Nadduli said, in reaction to reports that Bukenya is to be disciplined for backing an opposition candidate. “Yes, there is need to revise the laws that govern us as a party, you need to rein in the errant members; but again you can’t punish someone because they are joining another group,” he said. Yet Bukenya argues that the worst is yet to come for NRM unless something is done urgently. “The Baganda are beginning to see; the current generation is different from the old one that would sing praises because Museveni has given them something to eat,” he said. “His tactic of throwing a bone to silence a barking dog is no longer applicable in Buganda,” Bukenya added. On his part, Masaka municipality MP, Mathias Mpuuga, noted that the real desire for change is ripe in Buganda, more so because this is a cosmopolitan region with a broader and more critical look at issues. Mpuuga believes a united opposition is capable of winning up to 90 per cent of the Buganda vote in the next elections. However, as Todwong and other analysts have pointed out, voters in Buganda, as in other parts of Uganda, have shown a tendency of punishing NRM leaders at local level, but leaving Museveni immune. Away from its dismal performance in Buganda, NRM registered stunning victories in by-elections held in the eastern region, and shared the spoils with the opposition in the west. NRM won convincingly in Usuk, Kween, Butebo and Bubulo West, and only lost to the opposition in Jinja municipality East and Kamuli district. As for the west, out of the four by-elections held since 2011, NRM won Bukanga and Buhweju Women, while the opposition took Bushenyi-Ishaka municipality and Kasese Woman MP.